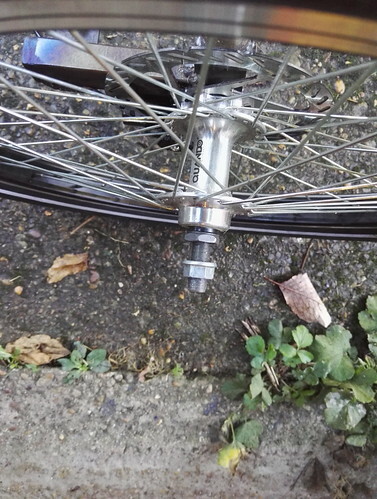 Two flat bars, arranged in a V. Point to RHS (facing seat rear). Top 'arm' fixed parallel to main tube at wanted drop. Jockey wheel/hinge at point, Jockey wheel on lower 'arm' tip. Spring compressing open end. Should gain at least cage length additional height...you might have to guide return above steering control rod as well, depending on height wanted. That sounds interesting. 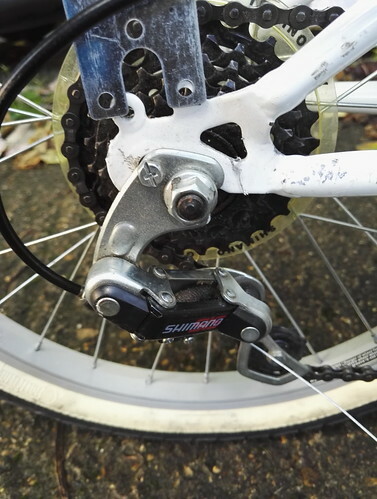 I'm having trouble visualising - is it essentially the sprung bit of the derailleur? It needs to be able to take enough chain to make the 52, 42 and 30 tooth chainrings usable. 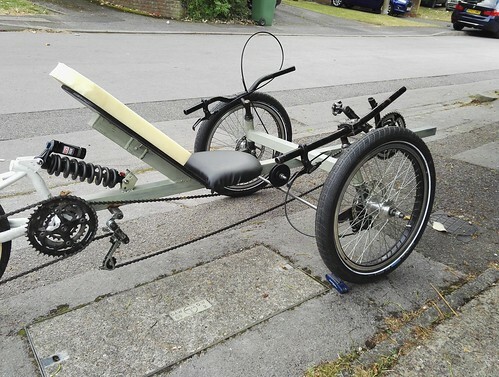 At least until I've sorted out the electric propulsion part and I no longer need the smaller chainrings (might take a while, given that I've been working on this for 20 months so far)! Ah. That picture explains a lot. I always wondered how trikes with an adjustable boom dealt with the excess chain - now I know. I guess the ideal scenario would be to have that setup where the top wheel is fixed and the bottom one is sprung such that it moves directly back away from the top wheel but parallel to the ground. I'm not sure if I can rig that with a spring and a slot - I might be better off just using a sprung derailleur arm (or regular singlespeed chain tensioner) with a pivot point significantly forward of (and higher than) the top wheel. Thanks iddu - I'll definitely try that solution once the trike is back up and functional. Could the mecb be mounted aa lot further fwd, so that it's nearly between the front wheels? Witb only slack from shifting chainrings to worry about, you coul also use a much shorter cage mech. Or how about mounting the mech back-to-front so that if it is clonked is just deflects, similar to a Pinion chain tensioner. Actually yes, that would be better; Get some appropriate sized open channel (so jockey bolts get support both sides), offset the jockeys slightly in horizontal plane, slot one ends mounting, and have two (external) springs putting slotted jockey under tension. Might need to slice out additional entry (or exit) space, depending on how you orient the channel/level of offset/resultant wrapped chainline. That would really flatten line / raise chain. The channel idea is a really good one - should allow consistent chain tensioning, taking up a minimal amount of vertical space, and hopefully be pretty straightforward to assemble. It doesn't need to slide very often (only when I change chainrings), so maybe I can get away with alloy as well. Now I need to find some to experiment with. Clearly there was very little penetration into the BB shell. 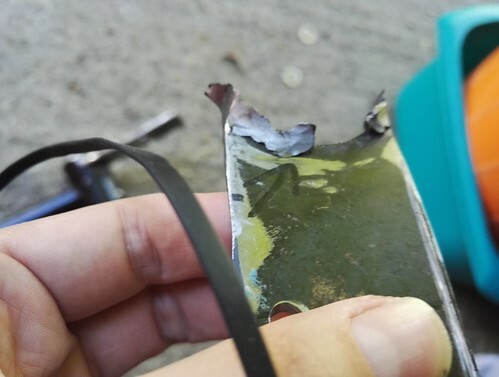 The extra heat meant that the BB was glowing red all the way through to the inside of the shell - the threads seem to have survived OK (I'll chase them with the tool to be certain), so the only downside appears to have been that I kept setting fire to the grease in them! Once the thread is chased properly then I can re-install the BB and get going again. Attach these to the inside of some suitably sized box/channel section steel, attach a pulley wheel to one end, and the spring on the other end. Smooth rolling and (relatively) self contained. I spaced the inner ring inward with a couple of washers per bolt, which means I can use the middle ring for the back chain. That reduced my gearing considerably (I think the theoretical top was 136", and now it's 103"!). 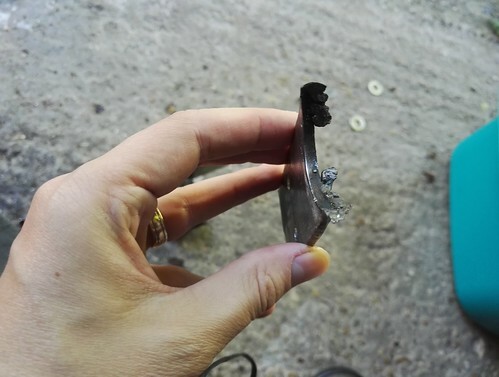 And I worked out what was causing the front wheel to lock up - it wasn't the brakes binding, but one of the bolts holding the rotor on had come loose! The head was totally mangled, but I managed to remove it, so I got to ride it up and down the street a bit more - the gearing reduction makes it a lot easier! 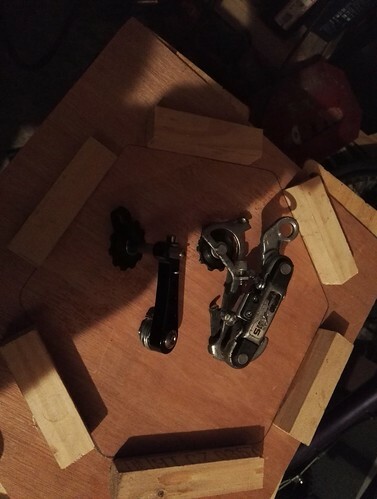 To get a nice sliding mechanism in place, what I'd want to do is fit the fixed front jockey wheel around about where the base of the seat is, and then that would give me a foot or 2 of space behind and under it to have the sliding pulley and the mechanism needed. Unfortunately, that's exactly where the tensioned part of the chain runs. I could reduce the deflection in the tensioned part of the chain by using a smaller diameter pulley wheel, or by putting the existing one on the top of the boom instead of the bottom (I'd rather not do that as it's pretty solidly welded on). But while that would make life a bit simpler, it wouldn't solve the problem. It might be part of the solution, together with some extra sheet on the side to allow me to mount everything below the tensioned chainline. I don't think it's properly ridable until I create a solution though. Well that was an unmitigated disaster. It's about as long as the arm on my junk derailleur. 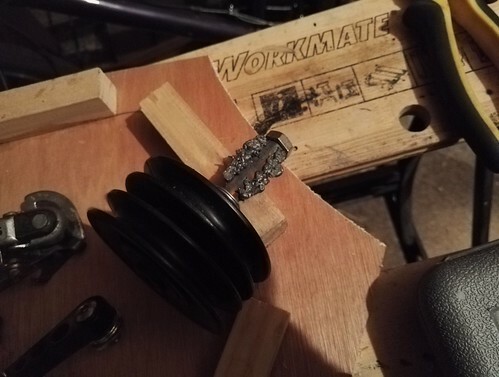 So I tried to work out how to attach it in the right place, shortened the chain, and generally realised that I can't use it on the mounting point very easily, and I need another one (or a fixed jockey wheel) to make the tensioning work. Then I tried to put a second roller on my existing mounting side by side so I could change the route of the return part of the chain. The central part of it wouldn't slot on properly, so I hit it a few times with a hammer to push it on. 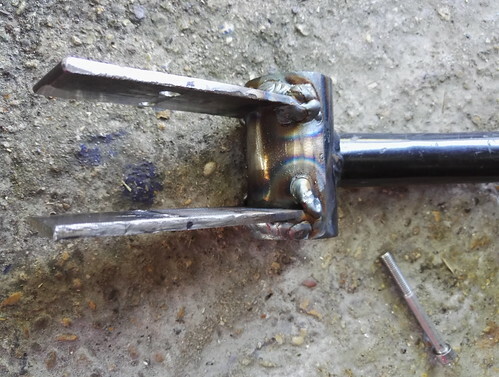 Then I realised that the bolt had moved in the tube, I hit the bolt, at which point my welds failed. 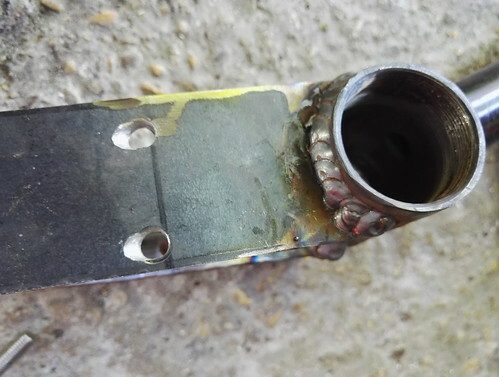 This was another weld I made when the tip on my welder was not working properly - I will have to check back and make sure there aren't any others (I think I've broken the only 2!). Right now I feel like recycling it! 1. 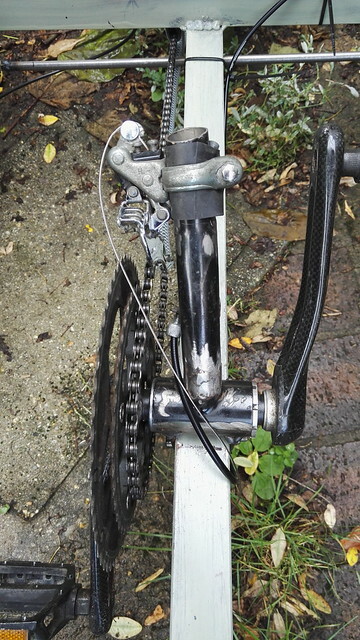 Carry on with my current jackshaft design and work out how to fix the chain tension issue. 2. 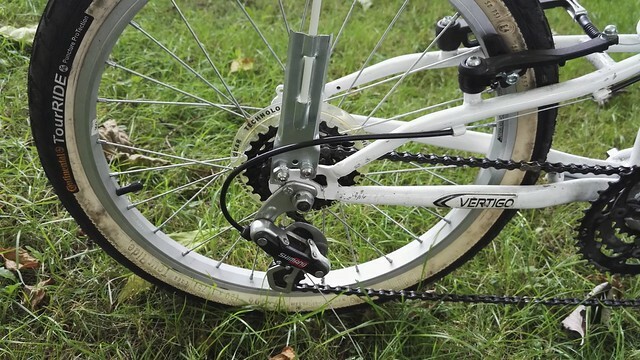 Change over to a different jackshaft design that uses a freewheel/cassette and so has a mounting point for a derailler for this chain - this means abandoning the theoretical ability to attach a motor to the left hand side of the jackshaft. 3. Give up on jackshafts. 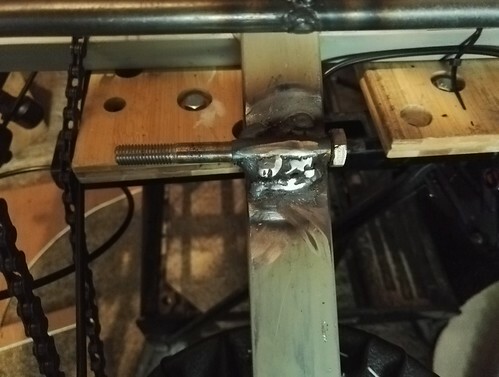 Weld the roller bolt back onto the frame, ditch the jackshafts and just run the chain front to back. 3a. Leave the rear wheel alone - this will give me really low gears (when I eventually sort out the front mech to shift chainrings) - something like 21 inches to 71 inches with the current rear wheel. 3b Get a new screw on freewheel (11-28 would give 21" to 90"). Also needs a new shifter as my current one only has 6 gears in index mode. 3c Build a new rear wheel on a decent hub meaning I can get whatever gear ratios I want. Means I need a new hub, spokes, rim (can probably re-use one I have) cassette, shifter and maybe derailleur. I've got stuff I need to do this weekend, so I probably won't have much time to work on it. Will consider my options. 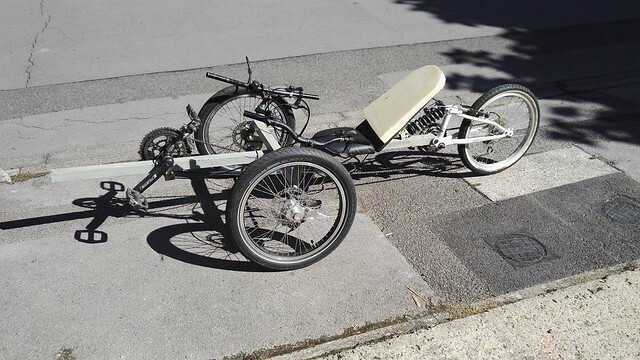 I'm kinda fed up of it now, I want to ride it (and start on my next build - a Spirit mid-racer recumbent). 1. I got a mirror from eBay and it's not very much use - it's quite small and a long way away, so it's not exactly helpful - what do people on here use (I assume you use mirrors - it doesn't feel very safe without them) and how do you mount them? It's kinda hard to undo the bolts though - I might end up having to drill it out. I'll create a new thread for that at some point when I do more than chop old bikes up! 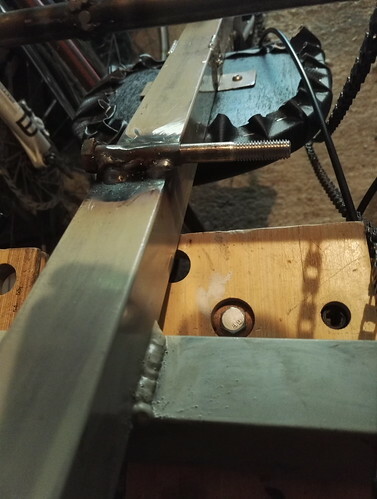 I tack welded along the edges of the clamping plates so that when they were done up the chainset is now parallel with the main boom. While it would be nice to get the front mech working, it's not actually vital to riding it - I can always change gear using my hand! So long as today's modification works, it feels a little like it's basically usable, and everything left now is fine tuning and adding nice to have features like mudguards/lights/mirrors/chaintube/proper seat covering/folding etc. That is a lot of things to add before it's "finished", but they shouldn't stop me geting on and trying it out. Hell, maybe I'll want to add under seat steering! 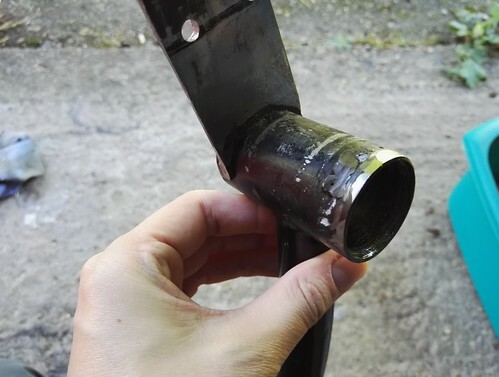 Too late for this build but re the bb shell, in Holland you can get (off the peg) bb fittings designed to slide on and clamp on 40mm box section (alignment square to your tube guaranteed). They say it's for 40mm alu box but I don't see why it shouldn't work for steel as well. I'll sort out the link if anyone is interested. Not the cheapest of solutions but might be worth having strong and hasslefree bb fitting. 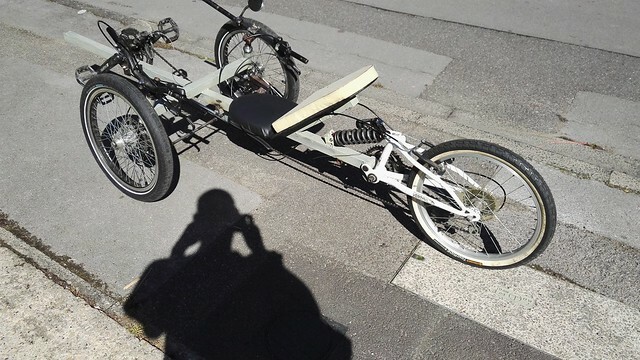 The link would be nice - I'm thinking of building a 2 wheel recumbent when this one is finally done! Hi mzjo - do you have this link? 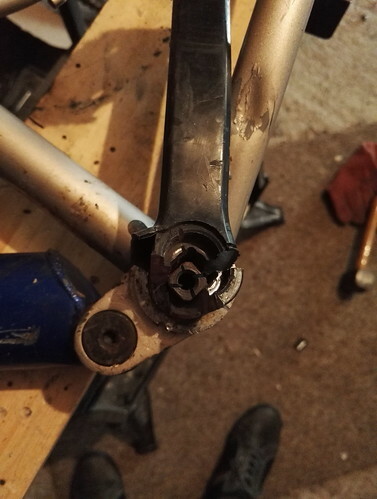 I made some progress on this project a couple of weeks ago - cut the tube for the front mech - made a moon shaped spacer out of 1mm steel, welded it into the gap and fitted the mech. I also dismantled an old rear mech, so now I have a little bracket to weld onto said tube to act as a cable stop. Waiting on another thumb shifter (will have to pop down to the Broken Spoke this weekend to get one) - I think I have sufficient outer and inner cable to do the rest of it now. The same weekend friends came around to borrow the welder to make a tall bike - they all had to have a go on the trike! Once the front mech is sorted, it will be time to ride the thing around the place a bit and sort out the headsets properly. Congratulations on the build. That's a fine effort for a first offering. Mild steel can obviously get very heavy but it's very forgiving and really good to MIG. It used to amaze me how much weight is added after welding [might have something to do with how much stuff I was putting down there]. And of course all sorts of scrap bikes are lying about the place ready to have their bits chopped off to be adapted elsewhere! it will be time to ride the thing around the place a bit and sort out the headsets properly. It's satisfying to build a bike, and equally satisfying to put some miles on it to show that it's a worthy machine and actually rides well. Putting through it's paces also tends to bring forth all kinds of weaknesses and issues that weren't apparent as it's sitting in the garage. But that's all part of the fun. Then more ideas comes and you go onto the next build. And then the next. I'm already wondering about whether I can teach myself to TIG using my current machine (I have a scratch start inverter box with a few tiny gas bottles), or whether I should go out and buy something that will require less skill to start! That would mean I could weld thinner more bike suitable tubes! 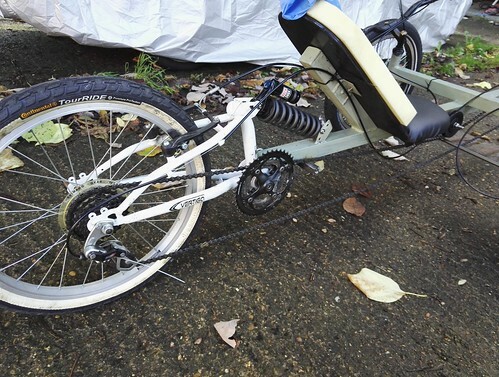 I've not yet got to the satisfying riding bit, but I already have some more steel tube, a chopped up MTB, and a kids BMX sitting in my garage waiting to turn into a SWB 2 wheeled recumbent. A head-tube and a back wheel and I'll have enough bits to get started! Must finish the trike first! I feel like I've been doing a 20 minute crunch! Is that normal? I assume that I need to sort out a headrest (and maybe a backrest that's a bit higher)? Thinking about it a bit more - maybe it's because I'm stretching a little to get to the handlebars? On the plus side, the gears all work, and they are low enough to mean that I won't need to get off and push much! The handbrake works well, and the front brakes are amazing (and contribute to it's agility because you can do torque vectoring ). On the negative, the gears don't go all that high (the problem with 20" wheels and no step-up gearing). I need to sort out the headsets, because they are loose, and it has wicked bump steer! I also need to make the backrest more effective, or add a headrest, because it felt like I was doing crunches for 15 minutes! And I should chop the handlebars in front of the stem so that they stop whacking me in the shins! Plus, if I actually want to use it, when I've sorted that lot out I need to make some mudguards and work out how to mount lights and a flag. Flag is the first job so I can ride it into town to get the headsets sorted at my favorite bike shop. Until it folds I don't think I can get it into the car! They aren't completely chopped, but they make a massive difference to how easy it is to turn without bashing my legs. I don't think the handlebar length is the problem for my back. I think the lack of an upper back rest is the issue - the backrest is currently stopping just below my shoulder blades. I need to build the top bit of the back rest as per the design. 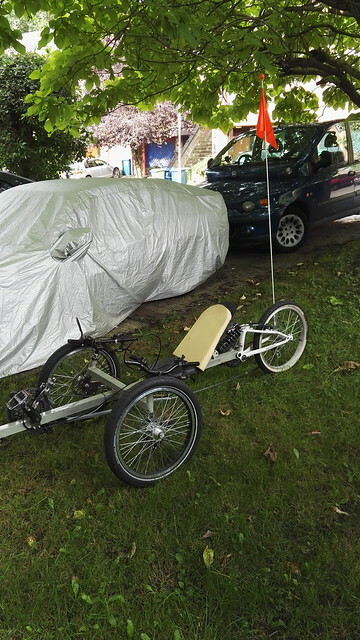 The instructions aren't clear on exactly how long it should be (or exactly where on my body the rest should stop) - where do they reach on other similar trikes that are set up correctly? I wouldn't bother. Tig is probably the hardest welding discipline to master and inferior equipment just makes it tougher. 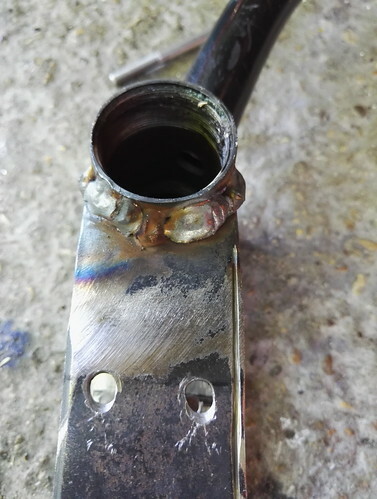 You would probably be better trying your hand at gas brazing for steel tubing. Seat back comes to just above my shoulders on my bikes (hardshell seats) and very slightly lower on barakta's trike (mesh seat). 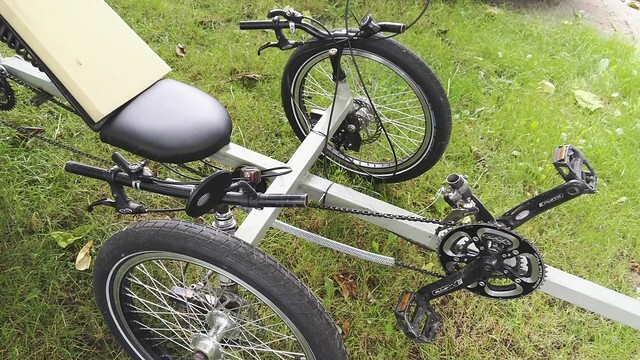 You certainly need your shoulder blades supported, as that's where you'll tend to push against the seat back while pedalling hard (recumbent equivalent of pulling on the bars). You might still want a neck/head support above that, depending on how reclined the seat is and how long you're likely to ride it for in one go. I had a go at TIG a few years ago - I was able to join 1mm flat sheet without filler wire OK. I struggled with scratch start though - I could imagine spending a lot of time sharpening tungstens and a lot of wasted gas if I use my little machine. I've not got any brazing gear, and given the garage is directly below the living room, I doubt I could persuade my wife that having an oxy acetylene setup down there is a good idea. OK. Sounds like I need to build a seat extender then. Thanks for that - I'll see what I can come up with.